← Day 64: Take a Hula-Hoop Class. Day 65: Picasso Exhibit at AGO. Has anyone seen my other eye? Nothing conjures up images of angular, multi-eyed creatures quite the way the name Picasso does. He is renowned mostly for his cubist paintings, but the current collection of his works on display at the Art Gallery of Ontario (AGO) as part of a world tour also includes several of his intricate sculptures, which surprised me. 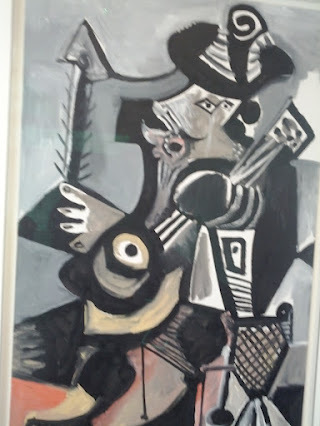 The exhibit is entitled Picasso: Masterpieces from the Musee National Picasso, Paris, and consists of more than 150 highlights from the 5000 or so pieces in that museum’s collection, which Picasso kept for himself and his family during his career. Like most artists of his time, there was no shortage of naked women and brothel scenes, plus a surprising number of men with guitars. Apparently, this kind of lifestyle is the fountain of youth, as Pablo lived to the ripe old age of 91. Not too shabby! Did you know that his full name, in the Spanish tradition, consists of names from both his father and mother, along with a plethora of others sprinkled in for good measure, which I’m thinking may be part of what caused him to be a little, well, special in the first place? It is Pablo Diego José Francisco de Paula Juan Nepomuceno María de los Remedios Cipriano de la Santísima Trinidad Ruiz y Picasso. 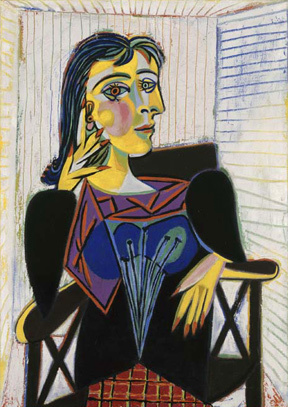 Picasso was his mom’s last name, and I’d say it was a splendid choice given the options available. I thoroughly enjoyed browsing through the Picasso exhibit at the AGO, as I got to see many of his works that were completely new to me. His earlier pieces in the collection actually proved that he could paint and sketch quite accurately and vividly if he wanted to; however, like one of his quotes immortalized on a fridge magnet in the gift shop exclaimed, “It took me four years to paint like Raphael, but a lifetime to paint like a child”. With quips like that, I bet this guy was solid gold at dinner parties. Where did I leave my smart phone? 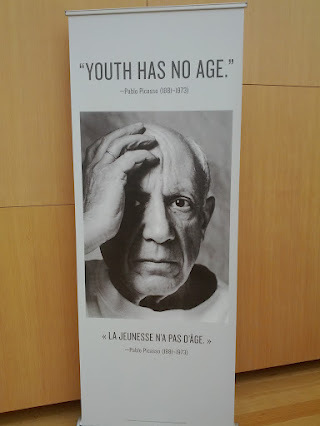 Another of his favourite expressions was printed on a banner that I noticed as I left the mandatory gift shop at the exhibit’s exit: “Youth has no age”, which was curiously juxtaposed above a picture of Pablo as an old man, holding his head as though he has completely lost his marbles. Awesome. Highlights for me within the collection included a painting of an older woman with what appears to be a glass eye, done entirely in shades of blue; this was contrasted in the next room with a painting of two young brothers, one riding piggy back, done in shades of pink. Trying to make heads or tails of the cubist paintings is always good fun, and best done after a few rounds of sangria, in my opinion. As I alluded to above, I really enjoyed the few sculptures interspersed throughout the exhibit, particularly the ones of ‘musical instruments deconstructed’ (my own title). A painting of one his muses, Dora Maar, is prominently featured on the cover of the exhibit’s guidebook, and rightly so – it was incredible, and easily my favourite. Her right hand looks exactly like a Birds of Paradise flower. Fantastic! If you are in town, and happen to have a spare hour or two, I would definitely encourage you to check out the collection, and then the rest of the AGO, for that matter, with its own gorgeous galleries and stunning architecture. This is the Picasso exhibit’s last stop on its world tour, before it heads back to the newly renovated museum in Paris, so if you don’t catch it now, well, you’ll just have to wait and pack your bags to go see it in Paris, and that’s a long way to go for a fresh croissant, baguette, chocolate mousse, gorgeous wine, pain au chocolat, and unbelievably scrumptious cheeses… On second thought, take me with you!! 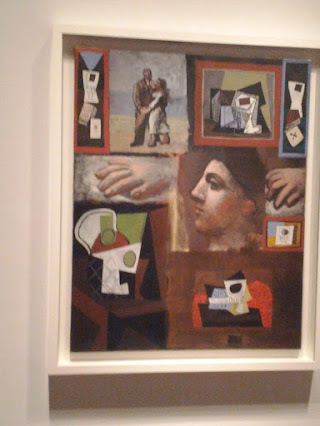 This entry was posted in Educational and tagged AGO, Art Gallery of Ontario, Educational, May, Pablo Picasso, Picasso exhibit, Toronto. Bookmark the permalink. 1 Response to Day 65: Picasso Exhibit at AGO. Reblogged this on PORTAFOLIO. BITACORA DE UN TRANSFUGA. 2000.2010.